Mike and I love a good date night! And while we’ve done a lot of different things for date night over the years, there’s one tried and true outing that always delivers: dinner and a movie. If The Rec Room is part of our date night, we also put a little bit of a twist on it: adding games in between the dinner and movie too. This month Mike and I partnered with The Rec Room to film their new Ultimate Foodie Date Night promotional video—eating some great food from their new Fall/Winter menu, playing some fun games, and (optional, but certainly our preference) catching a movie after The Rec Room fun. Watch the video below, check out my tips to ensure your own Ultimate Foodie Date Night, and keep scrollin’ for an Ultimate Foodie Date Night giveaway! WHAT IS THE REC ROOM? Mike and I often frequent The Rec Room at West Edmonton Mall! 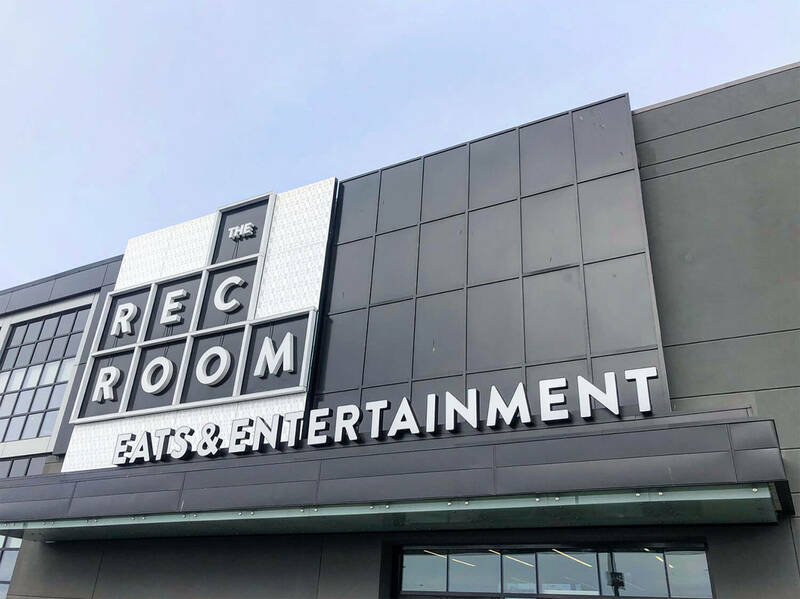 If you don’t know, The Rec Room is a gigantic dining and entertainment centre owned by Cineplex, with locations across Canada (including two in Edmonton: one in West Edmonton Mall and one in South Common). At The Rec Room you’ll find multiple dining areas, a poutine and donut bar, and over a hundred different games you can play using game credits (think old school retro gaming style but with lots of new school games). The Rec Room also plays host to trivia night, comedy night, live music and more! Here’s how to Date Night at The Rec Room, and don’t forget— “date night” can also be “date day” too! In fact I may prefer date days because the sun is out, the lighting for my food photos is better (lol), and then we can still technically squeeze in more activities in the evening if we wish. 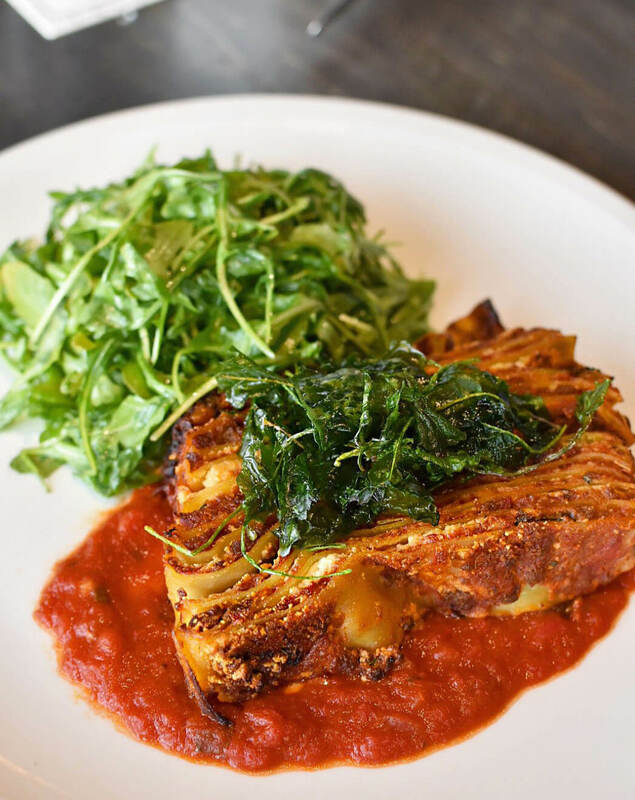 The 15-layer lasagna off The Rec Room’s Three10 restaurant menu! The Rec Room has some great food. Depending on what time you go, you could take advantage of their Happy Hour deals (the $6 mojito and $7 crispy chicken bites are excellent) or their brunch ($14 breakfast of champions poutine, anyone?!) or if your Date Night is going traditional (at night lol) then you’ve got lots to choose from with the dinner menu. The Rec Room’s restaurant Three10 is Canadian-inspired, with handcrafted dishes highlighting flavours from across the country—from coast to coast! The 15-layer Lasagna (seriously, it’s that many layers!) is a wonderful mix of beef and pork bolognese, house made pomodoro sauce, goat ricotta cheese, mozzarella, with an arugula side salad ($23). Mike is a big lasagna fan and ate this right up. You could also share a pizza like we did. 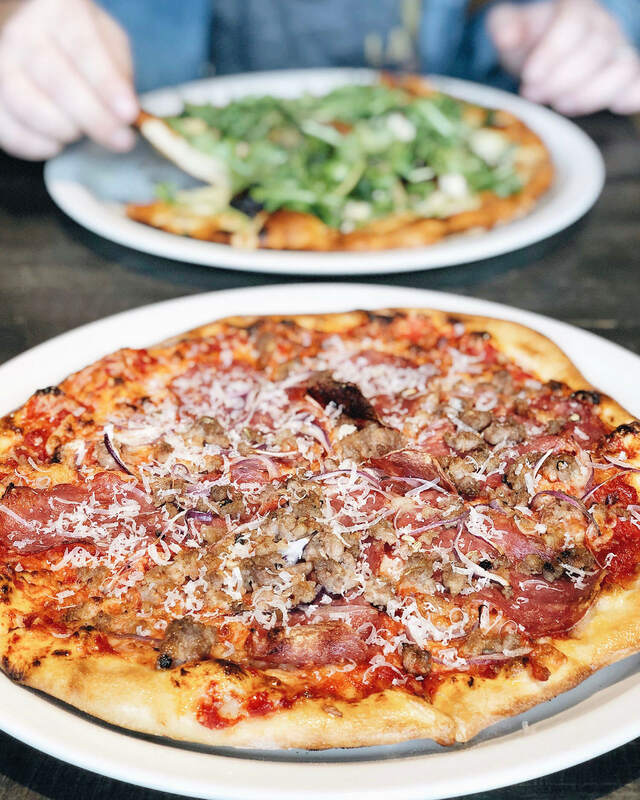 Dough is made in-house and meats are ground in-house too! The Butcher’s Daughter is my favourite with pepperoni, house ground fennel sausage, red onions, tomato sauce, fresh mozzarella and grana padano cheese ($17.50 for a 12”, $48 for a 24”). And you could try the delicious tender short rib sliders on steamed buns. (Steamed buns are so in right now lol). Bonus bites: you get complimentary unlimited popcorn at The Rec Room. MOVIE THEATRE QUALITY POPCORN. We get a little competitive but are overall good game sports lol. It’s easy and pretty affordable to load up a wristband with some game credits. There’s different rate levels and the more you pay the more extra bonus credits you’ll get! It starts off at $10 for 40 credits and goes up to 200 credits for $30. 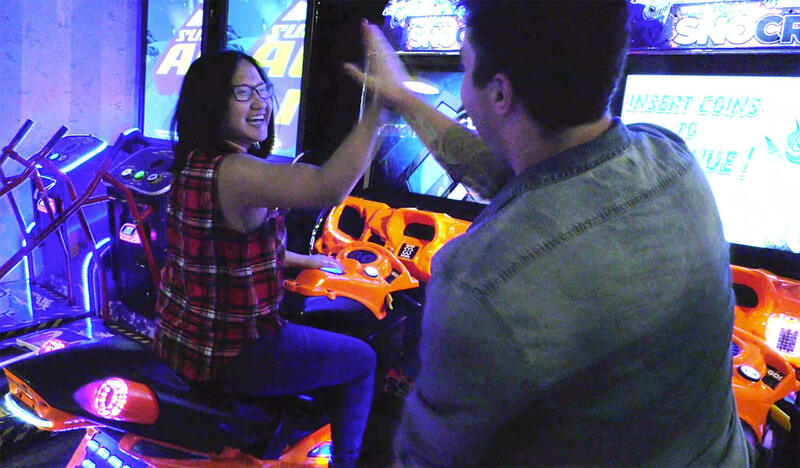 And if your date night lands on a Sunday to Wednesday, game credits are also half off at the West Edmonton Mall location! Mike and I find ourselves returning to a few favourite games like Mario Kart, a stacking game, a fishing game, and ones that pit us against each other (there’s fun dance and light challenge games). You could also try The Rec Room’s virtual reality games (which cost money, not game credits), but offers a pretty phenomenal VR experience. 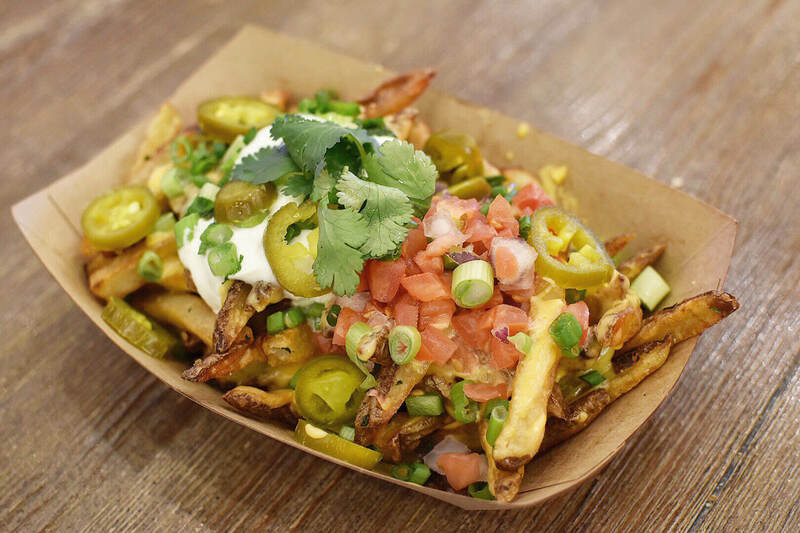 There’s lots of poutine and donut options at The Rec Room’s The Shed restaurant! In between your games you obviously need to refuel with a visit to either the poutine or donut bars (or both?) You’ve got lots of options for toppings too. I’m partial to the Poutine Supreme topped with beer cheese queso, pico de gallo, sour cream, pickled jalapeños, and spring onion ($8.50 for a small, $11.50 for a large) or the Trio of Meats which comes with rotisserie chicken, braised beef short rib, bacon lardons, cheese curds, and a black pepper gravy. ($10.50 for a small, $14.50 for a large). Over in The Pumps (that’s what they call the donut area because they can pump donuts with a different alcoholic fillings), some of our favourites are the Strawberry Cheesecake donut with fresh strawberry compote, cream cheese frosting, and vanilla custard, the Caramelized Banana Cream with burnt caramel, lady fingers, and banana custard, and the Fireside S’mores with chocolate glaze, toasted marshmallows, graham cracker crumble, and marshmallow cream. All donuts without extra pumps are $4, or $19 for a half dozen any flavour. Finally, as you get to the last leg of your Date Night, I recommend you catch one of the live shows (be sure to check out the event listings on The Rec Room’s website to plan your Date Night properly!) or catch a movie! Both Edmonton locations are conveniently located near Cineplex movie theatres and from now until March 31, they’re offering a Dine & Showtime offer where you get two movie tickets free if you spend $55 at The Rec Room’s Three10 restaurant! So there you have it! How to Date Night at The Rec Room. If you follow these 4-steps, I know you’ll have a great night out! This also works with friends or family too of course. Now I’m excited to partner with The Rec Room to give away a $100 gift card so you can have an Ultimate Foodie Date Night too! 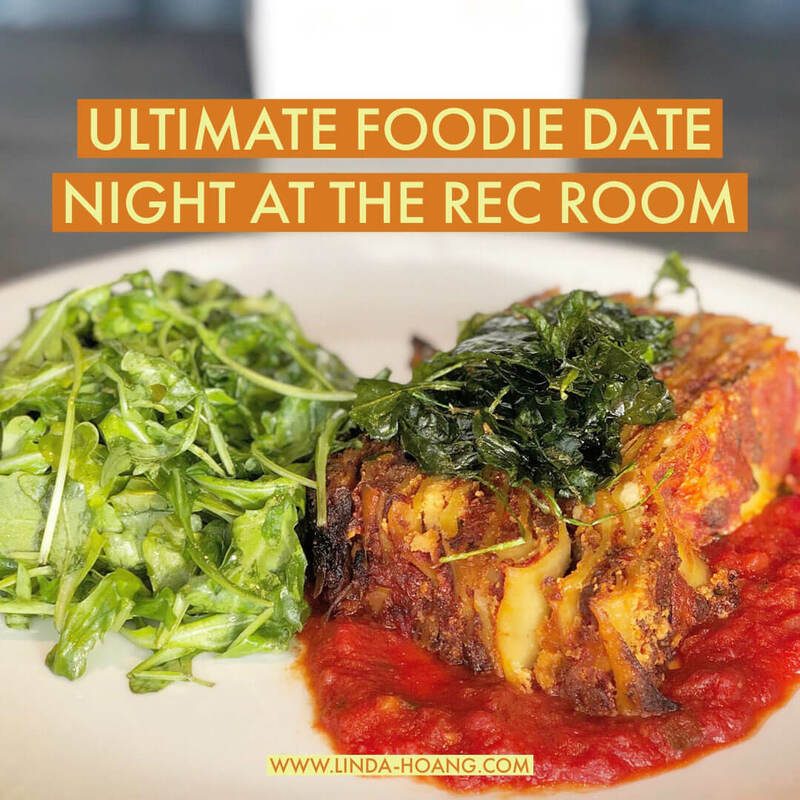 Enter to win an Ultimate Foodie Date Night at The Rec Room! What are your favourite things to do at The Rec Room? Let me know on social media or in the comments below! Pin + share my blog post Ultimate Foodie Date Night at The Rec Room! Disclaimer: This post was written as part of a sponsored partnership with The Rec Room. This does not impact views stated in the post. Mike and I love hanging out and eating at The Rec Room! Really enjoy the atmosphere at The Rec Room great food and awesome entertainment. I’ve never been to the Rec Room but your video sure makes it look fun. And OMG I must try that lasagna!!! The virtual reality games are so interesting to play! The Rec Room is such a unique atmosphere & fun experience.